Jonny Gray has been named as the new captain of Glasgow Warriors. The 21-year-old Scotland lock signed a new three-year contract this week and takes over from Al Kellock, who retired from rugby at the end of last season. "It means a lot to have been given the opportunity to captain the club, following in the footsteps of an inspirational leader," said Gray. "It's a very special day for me and my family and I'm really looking forward to leading the team." Gray, who won his 19th cap in the World Cup quarter-final defeat by Australia last month, has played 40 games for Glasgow since joining in 2012. 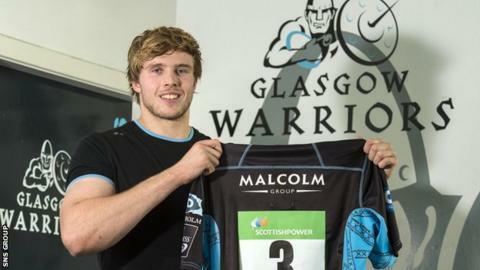 "Jonny is someone who seeks out information and relishes taking on challenges," Warriors head coach Gregor Townsend told the club website. "He did very well when he captained the side last season away to Connacht, in a difficult environment. "Al became the captain at a young age and grew into the role to become an outstanding leader of men. Jonny will lead in his own way but already has the respect of the playing and coaching group by the way he conducts himself. "The captain is one aspect of our leadership group and what excites me is that there are a number of leaders in our squad, setting standards, supporting and challenging their team-mates on a daily basis. "It's great for Jonny that he knows he'll have the likes of Josh Strauss, Rob Harley, Peter Horne and Chris Fusaro supporting him." Harley and veteran scrum-half Mike Blair have captained the Pro12 champions this season, with a host of players away on World Cup duty.